"Kelliokee"- Sparkling Traminette Wine is a HIT!!! MountainRose Vineyards proudly presents “Kelliokee”, a new sparkling white wine, symbolized by the mysterious lady in the Black Hat! This exciting new wine isn’t your typical champagne, prosecco or moscato. Kelliokee has more bubbles and higher alcohol content than moscato but has a similar dazzling fruit-forward palate profile with a welcoming sweet factor. Kelliokee is unique! She resembles a demi-sec champagne or perhaps a prosecco in sweetness and a moscato in aromas and flavors. Kelliokee' s inherent aromatics are simply stunning - orange blossom, honeysuckle, with soft rose water flavors in the bubbles followed by zippy tropical citrus tones on the finish! Kelliokee will soon become your favorite new sparkling wine. Intended to be consumed young, while it's fresh and vibrant, Kelliokee needs to be served well chilled and is downright delicious with apple desserts, fresh berries, salads, meringue pies, and cheese cakes. The sweet-zippy combination also makes this wine great with spicy foods, creamy cheeses and fruits-imagine brie and pears. Of course, Kelliokee is a great wine for your appetizers, brunches, and is unbeatable for celebrations, toasts, or any time you want to make our own party! Play with her! Let us know what you choose to enjoy with Kelliokee and we will compile a list of your suggestions to share on Facebook. 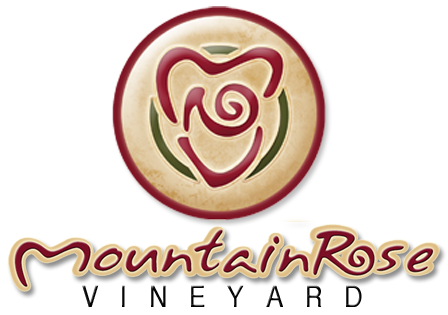 Now available at your favorite winery, MountainRose Vineyards. David, Suzanne, and Opie can’t wait for you to try it! So far, the response from our guests has been amazing. Join us each Saturday for tastings of Miss Divine, “Kelliokee”!